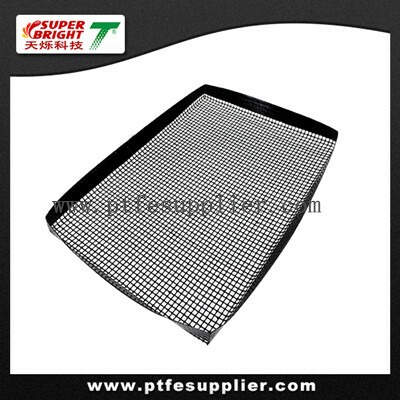 PTFE Non-stick Mesh Oven Basket offers heat resistance, excellent non-stick performance, so food can be easily removed from the basket without sticking, Safe for use in the dishwasher, non-toxic, safe for contact with food. Like the other mesh products it allows better hot-air circulation ensuring all the part of the food heated and make the food crispy and crusty and the food does not have to be turned during the baking process. It has fabricated side walls to prevent the grilled food slide outside of the basket ideally when cooking potato wedges, oven chips, garlic breads, canapes and finger foods..
With these feature, food can be easily removed from the basket without sticking, also it can be made into different sizes and shapes which the customers need.